1. (40 Possible Points) Explain, in detail, how the community has excelled in the past year. Provide SPECIFIC examples, illustrations, stories, etc. Sample topics might include ways the association enhanced the quality of life and/or property values, challenges the association was able to overcome, successful projects, excellence in board or committee work, organizational structure, policy development, or other highlights of community living. Optional: upload an image to illustrate your text. The Carolina Preserve (CP) HOA Board of Directors is a strategic, forward looking body, relying on our extraordinary Management Company (Kuester) for day to day operations. The Strategic Plan is updated with input from the HOA Board, Management, Board Committees, and more than 130 residents who participated in six focus-group strategy discussions. (The Strategic Plan is attached in Question 4.) Directed by the HOA Board of Directors and Management Company, four Committees of resident volunteers, each with staff and Board member liaisons, are chartered by the HOA Board: Architectural Review Committee (ARC), Finance Committee (FC), Information Technology Committee (ITC) and the Lifestyle Advisory Committee (LAC). We have limited the number of Board Committees, supplementing them with the creation of Task Forces for a variety of short term projects. The Committee charters and membership are one year commitments. The Task Forces, also comprised of community volunteers and chartered, vary in duration but rarely exceed three months. The Strategic Plan was updated (2019-2021), reviewed and published. Numerous policy updates and changes have been completed and approved. These include the Facilities Use Policy, the Club Operating Manual, creation of a repository of Legal Research and Analysis, the Emergency and Business Continuity Plan, the CP Records Retention Policy, and a new Infrastructure Improvement Fund and Spending Guidance Policy. CP endeavors to create a strong relationship with the broader community. As such we have fostered initiatives with Town of Cary (TOC) officials. Some examples include: The Cary Police captain has attended annual and other community meetings; our Neighborhood Watch program frequently included Police, Fire and other town professionals to promote safety and security, as well as the FBI speaking on fraud and internet scams; we hosted the annual CAP (Citizens Assisting Police) dinner at our clubhouse facility, Bradford Hall (BH). We have an active CERT (Community Emergency Response Team) representation within the community consisting of resident volunteers who have been trained in community preparedness in the event of anticipated disruptions and potential hazards following a natural disaster. Our CERT members work with the TOC’s first responders. TOC personnel have participated in our community’s 9/11 and Veteran’s Day ceremonies. Board and community members have joined the TOC Parks and Recreation committee, giving us a voice in future planning to benefit our residents. With two new parks planned, town officials have presented detailed plans on our premises, to our residents and solicited feedback. We collaborate with the TOC to protect and maintain the natural buffer areas and portions of the walking trail that are owned by the HOA. CP maintains a relationship with the Environmental Protection Agency and the Army Corp of Engineers for guidance regarding our wetlands. Township, County and local politicians are frequent visitors at CP. Whether they are campaigning and want us to hear their story or responding to our needs, our community is a force that is recognized and is heard. The Board recognizes the value in partnering with local realtors to help position CP as the premier 55+ community in the Triangle, and attract an active 55+ base of new residents to maintain the vibrant energy of the community. That homes often sell in a day, is a testament to the homes, of course, but also the community vibe. Board members, staff and volunteer residents collaborated on a “retail packet” including materials promoting CP and the surrounding area. In partnership with a few local realtors who are featured on packets, they are available at the BH front desk for prospective residents and realtors who drop in to BH. Production costs are funded by our realtor partners. The 2019 annual budget was developed with detailed assumptions for each spending account, which we call 'Basis of Estimate' or BOE, and was reviewed in detail at a community meeting in October. Questions were raised both at that meeting and in the subsequent weeks and clarifications were provided by the Board. This budget was unanimously approved at the November annual Community Meeting. A professionally prepared study of all HOA assets is completed every five years and is modified annually with real-life replacement costs and asset life. A Capital Improvement Task Force (CITF) was chartered and developed a policy for analyzing and approving any request for a future amenity as well as a three year funding plan. We are currently evaluating the establishment of pickle ball courts using this process. Throughout the year, the Treasurer, Finance Committee and General Manager closely monitor each spending category to identify any risks and opportunities to the approved budget. This monitoring enabled the HOA to generate a 2018 surplus which was 2.7% of revenue. Despite significant infrastructure improvements and an increasingly growing appetite for an active lifestyle, our residents’ recent and near term needs continue to be met without increases to our assessments. The Vision, as stated in our Strategic Plan is “to be a premier active adult community with a reputation for excellence.” CP prides itself on its 126 volunteer-led, chartered clubs and groups; 273 lifestyle events; and numerous committee, and volunteer opportunities each year. Can you improve that? We did and do. The creativity of our full-time Lifestyle Director is supplemented by resident input including a formal biannual fitness and activity survey. There’s no shortage of successful projects under the CP Lifestyle umbrella. Two community bike rides called for new residents and new bikers to join members of the CP cycling club in the spring and fall. Cycling club leaders were joined by CP’s Fitness Director. The spring ride alone attracted about 45 residents and focused on the neighborhood. What a great way for new residents to learn the streets of CP; we hit every one, all 15 miles of them. Our fall ride attracted a few dozen cyclists, and focused on demonstrating the easy route to the twenty-six mile American Tobacco Trail (ATT) which sits virtually in CP’s backyard. From the trail we ventured over to some of the local greenways, around the scenic lakes and tree lined paths for about 12 miles. At the conclusion of each ride, participants were invited to socialize at one of CP’s five pocket parks, treated to water and healthy snacks provided by the Lifestyle department. CP is a sponsor of the Chatham County senior games and is the host site for the Tennis and Horse Shoes competitions. The CP location has more than doubled the number of tennis participants as our clay courts are more amenable to aging players. In 2018, a task force was chartered to formalize a CP University (CPU) program for on-site life-long learning and education. Distinct from lifestyle contracted speakers, this program would promote lecture series, e.g., 4-5 weeks at the lowest possible cost (our target is $5-$10 per session per resident.) Five class series were successfully conducted in 2018 reaching almost 150 residents. The classes were: “2018 Great Decisions” (the eight week national program with topics defined by the Foreign Policy Association), “Frank Lloyd Wright,” “The Golden Age of Radio,” “California Zinfandels and Tastings,” and “Wines of the Pacific Northwest and Tastings.” By the end of 2018, six programs scheduled for 2019 were already established with leadership by the LAC and including input by residents. A New Resident Orientation (NRO) program was another successful project established in 2018. Designed and implemented by a task force, with supporting materials, a detailed work plan and resident volunteers to conduct several sessions, it continued as a quarterly program before the end of the year. About 150 new residents were in attendance throughout the year. In an established community with so much to offer it can be overwhelming for new residents. CP is a welcoming community and the orientation program helps accelerate new residents’ acclimatization to their new surroundings. The orientation addresses all aspects of life at CP but also the tremendous offerings provided by our location within the Triangle of N.C. New residents are invited to upcoming orientation sessions at the time they register for ID’s and website access at Bradford Hall. An email invitation follows. In addition, and email blast is sent to all CP residents prior to each orientation for anyone who may have not yet signed up. (The communication email blast is included in Question 4.) All materials have been updated for 2019. “CP Connections” is a magazine of professional caliber written, edited, published and distributed (to all 1360 homes) solely by resident volunteers. It is another resource for the community to learn more about other residents and events in and outside the community. Topics of interest range from book club reviews, to resident short stories, and even a puzzle or two. Each issue typically has a theme, supported by a feature story, such as interviews and reminisces by CP veterans about their wartime service or a photo spread of entries and winners in the annual CP Photo competition sponsored by the Photography Club. CP Connections is self funded through local advertising. CP is a welcoming community. It is also a charitable community. The CP Cares club is a conduit for residents to get information about the various volunteer and charity needs in the greater Cary and Triangle area. One resident was recently featured on WRAL TV for his work at the Durham Rescue Mission. Residents continuously volunteer their time at local food pantries as well as collect food for these pantries and the USO mission at the Raleigh-Durham airport. The CP Cares Club conducts an annual holiday “Angel” tree program, supporting well over 100 children each year. Many residents choose to serve as aides at a local elementary school while others, known as “The CP Geezers,” work at Habitat for Humanity. A new club, “Thriving in Place” (TIP) has been established, recognizing that an aging community will have unique needs while desiring to remain in our homes as long as possible. Our volunteers help those in our community. The volunteers can drive a resident to a doctor’s appointment or perform simple household tasks like changing a light bulb or a smoke alarm battery. The CP volunteering-mentality is a testament to our residents, facilitated by our Strategic Plan and policies, as well as access to technology including our website and data storage systems. In 2018 CP was one of two trial sites, and the only 55+ site, in the Research Triangle of N.C. for a program to prevent diabetes. Conducted by the North Carolina State University, “Eat Smart, Move More, Prevent Diabetes,” was a one year program. Participants were screened for eligibility. Those who qualified met weekly for one hour at BH. Based on the program’s success, NC State has obtained the funding to continue and expand the program in 2019. The program has been recognized by the CDC (Centers for Disease Control) and will be offered statewide and include all Pulte Del Webb© active adult communities. The cost to CP’s participants is $30 (and valued at $430). The $30 fee will be fully refunded upon participant’s completion of the program. To determine eligibility, fasting glucose and other factors were determined at CP’s on-site Wellness Fair in January. The 2019 program at CP begins February 8, 2019. Our 35,000 square foot clubhouse, Bradford Hall (BH), is our show-case amenity. It is front and center for realtors and potential buyers as a first impression of CP. As such, keeping it fresh and up to date is instrumental to preserving both the CP lifestyle and homeowner values. Bradford Hall is now ten years old and used by hundreds of residents on a daily a basis. Natural wear and tear presents an ongoing challenge. 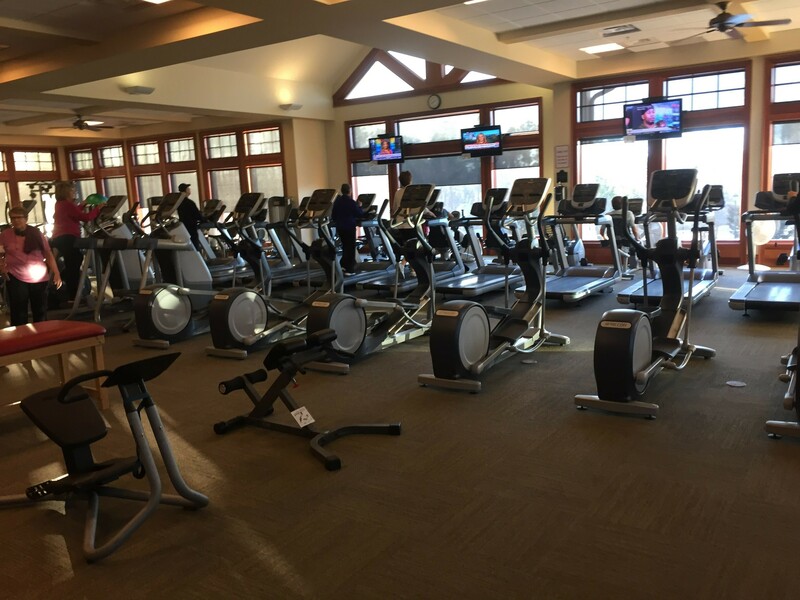 In 2018, we embarked on a major undertaking to refurbish the first level (excluding the indoor pool area, and the fitness center which as previously mentioned as renovated last year.) An Interior Design Task Force was established, including residents with interior design backgrounds and interests. A new color palette was introduced along with new carpeting, furniture, painting, staining of all wood surfaces, new art work, chairs and tables (including that for ballrooms to host over 160 people, etc.) were introduced. Existing furniture was repurposed when possible, and a financial strategy was developed to fund the costs of the recommendations. Upstairs is now complete—come see! Work for the downstairs will commence this year, again utilizing a task force. A “deep cleaning” schedule has been established for our Bradford Hall state of the art kitchen used by clubs and groups, often servicing more than 100 attendees. In addition, we replaced a 10 ton heat pump unit (HVAC), replaced and upgraded underwater lights with LEDs for the outdoor pool, orchestrated clock tower repairs, and replaced sand and filters for the indoor and outdoor pools. These projects were conducted to the extent possible with minimal disruption to resident’s access to CP amenities, and again, with no call for an increase to assessments. Carolina Preserve is a community that also values our out-of-doors. With an area that contains 1360 homes and all the common property that goes with it, it takes a village. Last year we restored, replaced and painted CP entrance signage, repaired and maintained landscaping and irrigation at CP entrances, replaced bubbler water features and plantings behind Bradford Hall, repaired entrance fountains, and restored and repaired 20 common area eroded swales and storm water inlets. Our Architectural Review Committee (ARC) is the go-to source for residents seeking to improve their properties. They are also the guardians of our quality appeal in preserving our property values. Twelve trees were replaced in buffer areas including common areas and walking trails, as directed by the Town of Cary. In 2018 the ARC took on brave work to allow the installation of solar panels on individual homes, working with the Board for a measured policy change. CP now has three solar homes already installed. CP endeavors to keep the community fresh, and up to date with new state of the art technologies, following resident preferences. CP loves our trees! With their growth, however, and because not all residents are arborists, this was the year of the tree. Too many trees were replaced with those that did not conform to community guidelines. To ensure the community appeal and property values would be maintained, the ARC set about to inform and support residents, by conducting a detailed seminar for all residents, before they spent money on remedies that would be inappropriate and/or in violation of community standards. CP has embraced numerous Go-Green initiatives. A “Beautification” group was established to add more color to the community, take advantage of resident green-thumbs, give the gardener’s an outlet for their talents and interests, and minimize contractor landscaping costs. For residents whose private property needed their own gardening gems cut back, the Beautification group volunteered to cut them back, dig them out, and use them for common areas. Hence, the purchase of new foliage was minimized, helping to reduce landscaping costs. The group of more than 50 volunteers planted over 2000 bulbs and 1500 plants, bushes and trees. This project provided a strong sense of self worth and value to those who participated, as well as pride among all residents who enjoyed the results. It is evident that CP residents take great pride in their community. Trash is not a problem. At least not ours! However, recently we have been surrounded by construction of several new developments and their contractors don’t necessarily clean up to our standards. Another CP volunteer group, Adopt-A-Spot, was established in partnership with the Town of Cary. Residents get cool Cary-provided hats and reflective safety vests. The HOA provides the donuts, and about once a quarter, together we go for a walk along the perimeter of our community. Along the way, we pick up trash and recyclables with Town of Cary supplied “grabbers” and trash bags. The township arranges to pick up the filled bags. Another win-win for residents to stay active, helping the broader community we enjoy, and helping to maintain our property values. The diverse Board consists of professionals from fortune 100 companies, CFOs, CEOs, Lawyers, Marketing and Market Research, Education, Real Estate and Technology sectors. These talented professionals bring an outstanding breadth of experience to bear on the development and maintenance of excellent operations for the CP HOA. A strong partnership has been established between the Board and our Management staff. The General Manager attends all Board meetings, and there is a Management liaison represented on each Board Committee. Lines of responsibility are clearly delineated, with the Management staff responsible for day-to-day operational matters and the Board responsible for strategic guidance and decisions. For transparency, in addition to the annual Community meeting, the Board holds monthly Open Working meetings, quarterly Community meetings, and an annual meeting for Budget review and comments. To facilitate communication to all residents the Board maintains a Board Communication page on our web site,www.cpamberly.net, which announces and details explanations or background on Board decisions. Our website is the heart of all communications at CP, and a focal point at our New Resident Orientations. The website has a public component to advertise Carolina Preserve to potential new residents, as well as a secure, private intranet component with information solely for residents. The intranet has detailed information to enhance the residents’ experience of life in CP, including a Resident Directory to facilitate communication among residents, a comprehensive event calendar to publicize Lifestyle and Club activities, Message Boards for residents to communicate with each other on various topics, and special sections devoted to communications from the Board and Management staff. One of the four standing Committees of the HOA, the Information Technology Committee (ITC), has the charter to oversee the website and to suggest new capabilities for the intranet. To facilitate resident’s usage, ITC volunteers conduct periodic small-group training sessions. Day-to-day maintenance of the website is supported by Management’s Webmaster. All of our 126 clubs and groups are chartered, with a clearly defined purpose and specific residents identified as the responsible leaders of each. Each club has access to the numerous website functions including a room reservations system (which handles about some 4500-5000 reservations each year, including club, group, Board, lifestyle, and individual requests), email and message board capabilities provided for communications with their membership, and registration for events. Each club or group also has unlimited private space in the document storage system for its own use. Several years ago, the HOA set a goal of running a paperless office and initiated an off-site cloud document- storage system. In 2018, the Board reviewed the HOA’s document storage system, and after extensive research and consultation with the Management Company, the Board decided to move from a simple document storage system to a full online Microsoft Office 365 environment compatible with the Management Company’s systems. The movement and reorganization of over 150 gigabytes of data to the SharePoint document repository in Office 365 is ongoing and will be completed in 2019, but already the HOA is seeing enhanced capability, closer ties with Management systems and reduced costs with the new system. Thriving in Place (TIP) is a club of resident volunteers who provide assistance to other residents in need of temporary help to be able to continue to stay in their own home, such as driving a neighbor to a doctor’s appointment, or changing a light bulb. TIP uses the data bases built into the website to manage the services provided, the volunteers for each service, and the individual service requests to see that all requests are fulfilled. TIP also uses the HOA SharePoint document repository to store its records of residents requesting services, volunteers providing services, and community resources. This effort is all managed and run by community volunteers, who can keep up with all the moving parts, providing this needed help by utilizing cloud storage and sophisticated website database capabilities. In addition to website and document storage support, the HOA and Management supports all clubs and groups with club/group leader training, financial support including accounting support such as filing their sales taxes, absorbing their income tax impact on the HOA, and providing their leadership with appropriate insurance coverage. In summary, strong leadership by the Board in partnership with our Management Company and Staff, use of our Strategic planning model and technology, and an extensive network of resident volunteers is what makes CP a successful model for excellence. At Carolina Preserve (CP) the HOA Board working with our Management Company (Kuester) provides the professional leadership examples for our community. CP utilizes professional and best in class practices in guiding the community. The annual development of our rolling three year strategic plan engages the community for input. First created in 2017 (for 2018-2020), in 2018 we developed our update for 2019 through 2021. The plan documents priorities that all residents can understand, and is the basis for budgeting. In 2018, it resulted in a vote to unanimously approve the proposed budget. For transparency the Board holds monthly Open meetings, quarterly Community meetings, and an Annual meeting for Budget review and comments. To facilitate communication to all residents the Board maintains a Board Communication page on the web site that provides announcements and detailed explanations, and sometimes background on Board decisions. An email address for the Board is available for all residents to send questions, comments or concerns. All seven Board members see all emails sent to this address. The Secretary provides a prompt acknowledgment of receipt, or an answer, securing input from other Board members, as needed. Items may be added to Board meetings if discussion is required. At times, emails to the Board are operational in nature, in which case the email will be forwarded to the Community General Manager, or the resident will be instructed to do so. The Board operates with consistency, and as such, most residents understand where to send the email in the first place. Board meeting agendas are made available to all residents five days before meetings along with any other documents that are relevant to the agenda. A significant initiative of the Board and Management Company is to involve residents in the decision processes and projects undertaken. This enabling process builds stronger community buy-in to projects and accomplishments. We use Board appointed committees (Architectural Review, Finance, Information Technology, and Lifestyle Advisory). A new committee, Club and Group Advisory, is under review for 2019 to facilitate communication between the Board, Management Staff, and the Clubs. Each committee serves for one year, with charters that define their roles and responsibilities that empower them to own the specific issues and work with the Board and Management Company toward effective and efficient solutions. Each committee distributes a “call for volunteers” and includes a brief (or detailed) description of the charter, and desired skill sets for the volunteers. Respect and team work are high on the attributes we look for in filling committees with members. CP is fortunate to have an extremely well educated and talented resident body. Once the membership is established, the committee (usually 5-7 members) elects their officers. Committees serve for one year and typically meet bimonthly or monthly and issue minutes. We also use resident led Task Forces to address focused problems, challenges, or opportunities. Task Forces are generally identified as a result of the Strategic Planning process. They have been created by the Board to address "short term" projects, with specific deliverables in a specified time frame, e.g., three months. The Board sends out a call for volunteers on an "as needed" basis, again articulating specific skills requested, and again, with respect, and experience working in teams among the minimum requirements. Task Forces are disbanded after the project’s objectives have been met. For example, in 2018 we had a Home and Garden Task Force to create a vendor fair for the community bringing all the spring vendors onsite for residents’ easy access. This was highly successful and was attended by over 450 residents to sign up for services such as power washing, window cleaning, painting, housecleaning, electrical services, car wash, landscaping services, garage organization, patio construction, vent cleaning, etc. Other Task Forces may complete their project with a need for it to continue as an ongoing program for CP. For example, another task force was created to establish the Carolina Preserve University (CPU). This is a continuing learning program offering a series of low cost classes, typically 3-5 weeks, onsite, to residents throughout the year. This task force of just a couple of individuals, worked with our Lifestyle Director, putting the initial programs in place. However, once the task force determined what could be done and how, establishing continuity for CPU was fundamental. Part of the task force’s charter was to document the work plan; who does what and when, a budget for compensation of professional instructors, and guidelines to define what constitutes a CPU offering (vs. other Lifestyle lectures, etc.). Now led by members of the Lifestyle Advisory Committee (LAC), and supported by the Lifestyle Department and Webmaster, CPU has been established as an ongoing program, with the tools for continuity, regardless of resident or staff changes. Five CPU programs were successfully offered to the community in 2018 (as noted in Q1.) In fact, by the end of 2018, six more offerings were already identified for 2019; one already completed (Seduction of Carmen; The Opera’s Music and Story), one in progress (Great Decisions 2019) and others announced, in the registration phase, or planned for deployment in 2019 (The Legacy of Ancient Greece, For the Birds, and The Story of the Grape.) A unique email address, CPUniversity@cpamberly.net, is available to all CP residents as a central collection point for new ideas and contacts for offerings. A class-specific message board is available to the students to receive information each week as well as to dialogue with eachother. A short survey is sent to each class participant for feedback. The program has been extremely well received with class offerings usually “sold out.” CPU offerings span a breadth and depth of topics that intellectually engage our residents, contributing to the vibrancy of our community. Another task force developed a comprehensive New Resident Orientation (NRO) program. New residents were invited to attend a two-hour presentation at the community clubhouse with light refreshments. The materials are presented by other residents, utilizing a detailed packet (see submission for Q4), with various supplemental handouts (e.g., vial of life from CERT, the monthly calendar, a Thriving in Place community brochure, etc.) The presentation and packet are organized to be coordinated with material on the website, with appropriate sections projected on a full screen for residents to get familiar with how to find just about anything CP-related, on the website. Residents learn how to check the community directory, find information on the various message boards (and how to search for a new doctor or dentist, etc. ), how to join clubs and groups, and learn who’s who on the Board and Staff. The material covers not just the programs and services offered within Carolina Preserve but information throughout the Triangle area. It covers local and major shopping areas, centers for performing arts, utility contacts, medical services, volunteer opportunities, how to advertise items for sale when they realize they moved too much stuff, etc. The 2018 Capital Improvement Task Force (CITF) was chartered to develop a policy for analyzing and approving any request for a future amenity as well as a three year funding plan, utilizing a cost benefit analysis approach to identifying priority projects in support of the Strategic Plan. The use of professional, analytic tools contributed to an objective evaluation and selection of a mix of projects for 2019-2021. Approximately two-thirds of the fifteen opportunities were identified as High Value/Low Cost. A Pickle Ball Task Force was established as a direct result of the CITF’s reporting. The Pickle Ball TF began the research and costing for a new Pickle Ball amenity at Carolina Preserve. Eleven residents worked with an engineering firm to identify locations and work with Town of Cary for all necessary permits and approvals, and final evaluations are underway. An Election Task Force is established on an annual basis to oversee the election of the Board of Directors. Board members serve for two years, with a maximum of three continuous terms. As a seven member board, typically no more than four members are up for election at a time. The Election task force is comprised exclusively of residents and the Operations Manager. Together they are involved in establishing the schedule leading up to elections, organizing two “meet the candidates” forums, gathering the questions from residents in advance for the forums, moderating the Q&A sessions (including the preselected questions but also spontaneous questions from the floor), creating and monitoring the paper and electronic ballots, and verifying the results. Processes and lessons learned are fully documented. In 2018 we had a survey blip very early on; it was caught virtually immediately, explained to the community, and properly remedied. Each year members of the task force may be returning or new, but with proper documentation, the goal is always to ensure a professional election process with proper oversight and results that can be trusted by the entire community. Carolina Preserve residents feel fortunate and support a strong commitment to our community at large. The scope of volunteer efforts and non-profits supported within our community is massive. There is a very strong program for food drives, clothing drives, etc. Many residents volunteer time at places like the Durham Rescue Mission, local food pantries, Read and Feed, Ronald McDonald House, Rex Hospital, CP Cares, USO, Vets to Vets United, local Schools, etc. Groups of residents travel weekly to perform work for Habitat for Humanity, building decks, installing windows, painting, etc. The annual Angel Tree program and School Backpack programs support hundreds of children annually. The list is long but the pride and sense of accomplishment by our community cannot be measured. 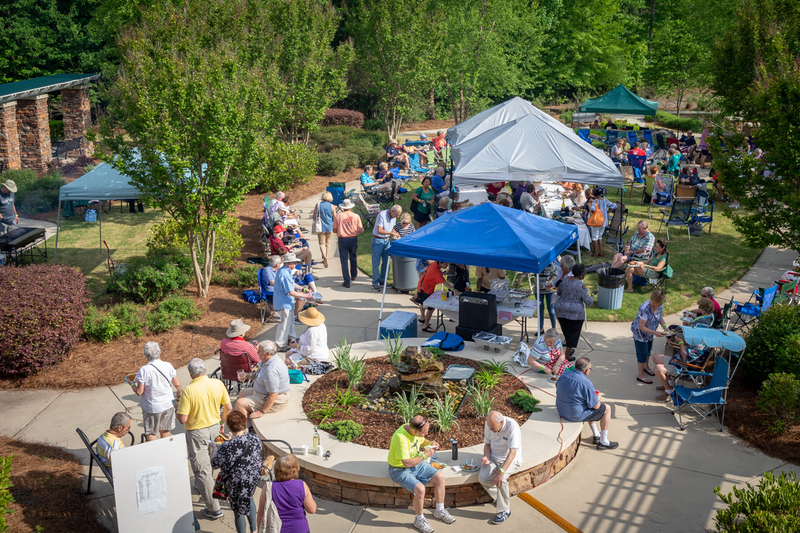 Carolina Preserve Clubs and Groups provide our residents with a wide spectrum of interests, events and activities that culminate in valued and rich lifestyle opportunities. We have social groups, theater groups, political groups, card groups,” In the News” and discussion groups, coffee klatches, wine and beer clubs, a Golf club, Tennis Club, Hiking club, Bird watching club, art clubs, a first-class pottery studio and club, and multiple activity groups; a club or group for just about any interest. We have formal fitness programs and swimming pool aerobics. We provide personal trainers onsite and a Wellness Director to assist residents to maximize the best use of the extensive fitness equipment and programs provided. Annual Wellness and Health fairs are planned as educational opportunities for our residents. Our clubhouse is fully occupied morning, afternoon and night almost seven days a week by residents pursuing an active lifestyle. Residents are kept informed of all the activity opportunities by posters and emails but also by the weekly 20+ page Lifestyle’s department Newsletter, and monthly calendars. (Sample content from a weekly Lifestyle Newsletter is attached to Question 4.) All of this happens on a very reasonable budget managed efficiently by the Management Company and the Board. But it would not be successful without the many, many Carolina Preserve resident volunteers within our community that give of their precious time and efforts. Task Forces ensure that CP evolves and involves residents in the ongoing need to pursue new opportunities and resolve challenges. Utilizing various processes and procedures, including analytic tools, surveys, and rigorous documentation contributes to the systematic continuity of successful programs. Residents establish the clubs and groups and provide the leadership to set programs, plan events and enlist vendors for food, entertainment, lectures, etc. The Board provides the leadership and community policies, including the detailed, updated and maintained Club Operating Manual and Facilities Use Guide that all the clubs and groups abide by. The Management Company enforces the policies, and provides club training and accounting support. With clear and effective communication, it all works. Not without wrinkles at times but even then we always seem to be able to work these out. 3. (25 Possible Points) Explain SPECIFIC examples to show how the organization communicates with the membership, on both a regular basis and as-needed during the year if applicable. Describe how technology is used to accomplish community communication. Provide images of examples please. Carolina Preserve is a large community of 1360 homes and over 2200 residents. Technology is the lifeline that enables our residents to stay in touch with everything that is happening in and around Carolina Preserve in Cary, NC. Our community has a clubhouse (35,000 Sq. Ft.) that supports Lifestyle events (273 in 2018) and 126 Clubs. Between 4500-5000 events are scheduled annually. Events range from meetings, lectures, classes, Health and Wellness Fairs to Murder Mystery dinners, Mardi Gras Galas, formal dinners, cooking classes, community meetings, card game tournaments, arts and crafts workshops, Wind Down Friday’s with musical entertainment in our clubhouse lobby, breakfast with Santa and many, many more. With effective use of technology, we can work to manage everyone’s expectations with accuracy and avoid double bookings. It all starts with our website, www.CPAmberly.net that is customized for CP to support public and private information sharing in several main areas. General information about Carolina Preserve is available from the website without requiring a login, while private information about residents and the community is restricted to HOA members only behind a login screen to a private, secure, encrypted intranet. (The 2018 Strategic Plan has prioritized an initiative to update and enhance the public side of the website and work has begun). User access to the intranet is managed by staff, requiring proof of home ownership or residency in CP to be granted login credentials. 2. Lifestyle Department – CP Lifestyle information and Calendar, event registration, Wellness Classes, Pool Information, CP Photo Albums, and Box Office Ticket information for area venues. 3. Governance – HOA Board of Directors including photos, Board Communications including scheduled meeting communications, The Strategic Plan, Committees and Task Forces including charters, membership, and meeting minutes, and CP document links. Document links assist residents in finding everything from Architectural Review Committee (ARC) modification and fast track forms to financial information to high level laws and rules such as Federal, State, Town of Cary and community covenants, by laws and more. 4. Groups and Clubs – Residents can search for clubs, be directed to club specific websites, join clubs, check club activities via a club events calendar, check room availability and reserve rooms with the room reservation system, and access club and group forms. The latter provides the links to easily access the Club Operating Manual, Facilities Use Guide and policies, club and group charters, accounting and tax forms, etc. 5. Resident Services – Includes Management company information including staff photos, Website Help Desk, Landscaping services, etc. 6. Marketplace – Where residents can check or submit classified ads for products and services offered or wanted, real estate, pets, and ticket re-sales. There is also a section with contact information for all vendors who pay to advertise to CP residents on the website. An image of the top portion of our Website (Intranet) main page, showing the drop down boxes under Governance, with an example of HOA BOD Communications has been included as an example of communications for this question. All Carolina Preserve residents have access to the website via their computer, tablet or smart phone. Or they can use the computers at the clubhouse. Website classes are routinely scheduled to assist residents to more easily navigate the website. New Resident Orientation presentations are organized in tandem with the website layout, starting from left to right on the top blue ribbon, and reviewing details including drop-down menus. The administrative side of the website includes the ability to send mass emails to all members or to selected subsets, such as members of a committee, task force, club or group. The General Manager uses this capability to send out important announcements and updates to the entire community. Emails to the entire community typically have over 60% open rates. Committees, task forces, clubs and groups also use the website email function as well as message board functions to communicate with their members. An example of one club’s email announcement of a future event to their club members has also been included as an attachment to this question. complex set of Microsoft Excel spreadsheets. For transparency the Board holds Open Working meetings monthly, Community meetings quarterly, and an Annual Meeting for Budget review and comments. The November Annual Community meeting is held offsite, to provide a year-in-review, present results of the Board elections, introduce the new Board including newly elected members, and vote on the budget. Residents can also vote by proxy if they will be unavailable for the meeting. In 2018, the budget was approved unanimously. To facilitate communication to all residents the Board maintains a Board Communication page on the website that provides announcements and detail explanations or background on Board decisions. As with many items available via the tabs, information most frequently accessed are also available directly on the home page. The web page is easy to navigate and has a search feature for ease of lookup. The Board Communications page includes a detailed document reinforcing that communications with the Board is a two-way process, encouraging all residents to express their opinions. An HOA email address, HOA.Board@cpamberly.net is published for receipt of all emails to the Board. The document describing how to best communicate with the Board is found under the Governance tab’s Board Communications drop down page on the website. (This document is provided in Question 4.) Community members are directed to the General Manager’s email for operational matters. Most questions and topics of interest can be answered with published information on the Board Communications page and/or by attending the monthly, quarterly, and annual Board meetings. On the right side of many website pages is an advertisement, as you can see on the website example attached to this question. Advertising on our website is one of many vendor options that contribute to CP’s revenue stream to offset website, and lifestyle costs. Reduced costs are passed on to the community with more frequent, high quality lifestyle events and contributing to the quality of life expected at CP. To supplement the Carolina Preserve website, the Lifestyle department produces a weekly electronic Newsletter. The Newsletter is emailed to all residents plus it’s available from the home page of the web site. The Newsletter focuses on the calendar of upcoming events for the next several weeks. Upcoming events include both Lifestyle offered events as well as events organized by clubs and groups. The Newsletter typically about 25 pages or more could include upcoming lifestyle events (e.g., New Year’s eve dinners and dance parties, weekly movies at the clubhouse, etc. ), on premises coffee houses with outside entertainment, CPU offerings, a Chinese New Year’s dinner and celebration, seminars by visiting financial advisors, health and vendor fairs, etc. as well as fitness classes. The electronic Newsletter features a “registration” link for real time registration for events. In addition, the Newsletter promotes club events, tournaments, and informs residents of some local activities. Each Newsletter updates the “save the date” section which lists all lifestyle events known at the time planned throughout the year. This Newsletter is emailed every Friday morning. In addition to the weekly electronic distribution, one can always find the latest Newsletter on the website. CP recognizes that not everyone prefers electronic communication. To support our residents in uncovering the many gems offered at CP and, for those who may struggle with an online event registration process, the Lifestyle department hosts a weekly “Ticket Tuesday” from 10 am-noon, at Bradford Hall (BH). Residents can stop by the set up table, meet with the Lifestyle Director and/or Assistant, view posters about the upcoming events, ask questions, and be registered on the spot. At other times our BH front desk personnel are trained and always happy to register residents for Lifestyle events. Once registered, an automatic email reminder will be sent the day before the event. Carolina Preserve technologies are managed by an HOA Board sponsored IT Committee. Their charter roles and responsibilities are well defined. This committee works closely with our Management Company to collaborate on security software protection, data protection, member privacy, Wi-Fi services (routers) throughout our 35,000 sq. ft. facility and surrounding areas of the outdoor pool, bocce courts and putting green. As a community, we strive to embrace evolving technologies. In 2018 our Architectural Review Committee worked with the HOA Board to revise policies to introduce the use of solar technologies. Currently three homes have installed rooftop solar panels. Managing our facility, at the current and planned levels of lifestyle services and costs without technology would be either impossible or much costlier due to a larger workforce required. In 2019 Carolina Preserve will analyze installing a comprehensive sound and light system for our ballrooms and stage areas. Also, we will continue investigating the use of drones for uses such as inspecting hard to inspect retaining walls, landscaping, creating marketing videos of the community and enhancing security.